Her concern is lovely and she's so keen to help. Have you ever made any scrumpy with the windfalls Kev? No cider this year Dave, not enough time. Next year maybe! So every one of your stored apples has a little bite out of it .... lol. That is the trouble, if I tell her she's had enough she grabs another one and runs away laughing! 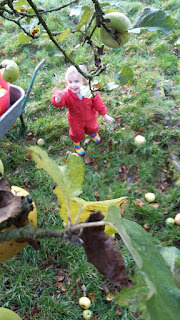 All 2 year olds (and older) should have the pleasure of apple picking. We country folk take these things for granted. We do! I remember reading the national trusts list for 50 things you should do before you're child is ten and one was eat an apple straight off the tree. My girls have certainly done that one ! She''s a cute little helper. I love them in their big all in one suites! Hey that's too cute. My son used to love to climb in the apple trees when he was a youngin. Thsi little one likes to try to climb up. They're quite fearless when they want to be. They quite like a ride on the quad bike as well! You will be watching her climb up there soon! She tries now but she's only tiny so can't get very far luckily. Doesn't stop her climbing on everything else though! 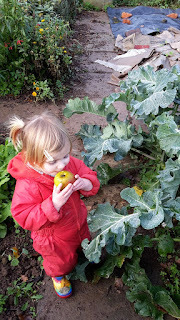 We've had a bumper crop this year! I've made two huge batches of applesauce; the first all got eaten, the second i'll freeze in small portions so we can enjoy it over the winter and into spring. 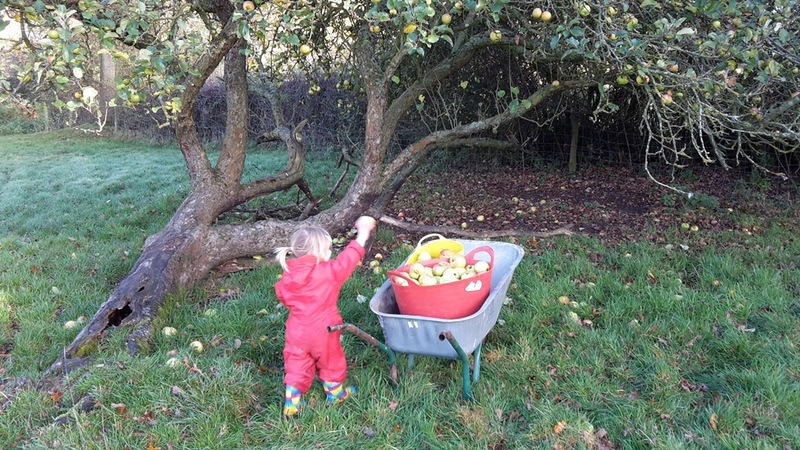 There are more to collect, which we can use for pies or for eating right from the tree. I've hardly used any of these really. I should do more but time is slipping away and I need to get things done before our next baby comes along! Ah, lovely. Which varieties were you picking, Kev? These were Howgate Wonder, nice big cookers and cook up lovely. We have many apple orchards here in North Georgia. They have barns by the road, and they sell apples and apple products in season. 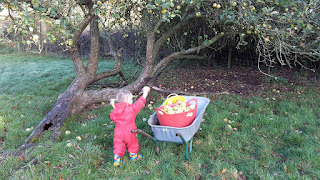 When my kids were little we used to go to the orchards and they let you pick your own apples. The kids always enjoyed it. ~I think kids and trees is always a good combination. My brother and I spent so much time climbing trees when we were younger, it was great fun. So much so that he became a tree climber!